Martin Kramer, “Anwar Sadat’s Visit to Jerusalem, 1955,” in Nationalism, Identity and Politics: Israel and the Middle East. Studies in Honor of Prof. Asher Susser, eds. Meir Litvak and Bruce Maddy-Weizman (Tel Aviv: The Moshe Dayan Center for Middle Eastern and African Studies, 2014), pp. 29-41. Anwar Sadat with Jordanian hosts at the Dome of the Rock, December 1955. What was Sadat doing on that visit? The question is left unanswered in the autobiography, where Sadat simply notes that his famous 1977 visit was his second to the city.2 The 1955 visit is similarly omitted in the biographical literature on Sadat. Analysis of the visit, aside from satisfying curiosity about the episode itself, sheds light on the situation of divided Jerusalem prior to 1967, and the status of Jerusalem in Islam. As for the location of the building, Sadat had already set his sights on an appropriate tract. Standing above the Jewish cemetery on the Mount of Olives, overlooking the Dome of the Rock, he asked who owned the promontory. He was told that it belonged to the waqf, the authority for Islamic religious endowments. 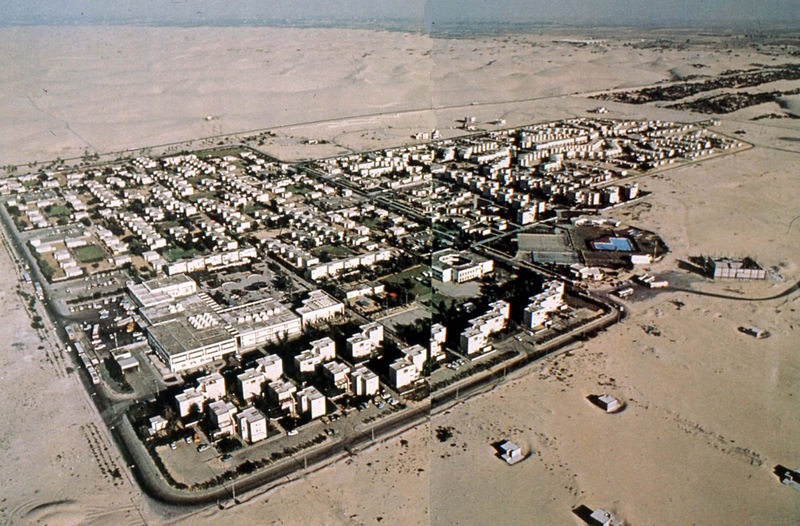 Sadat expressed his desire that the Islamic cultural center be built there. The holy city, he said, had to reflect the greatness of the Arabs and Islam, and so it had to expand. But he added that the precise site of the center would be determined in consultation with the Jordanian authorities and the Egyptian consulate in Jerusalem.7 He then proceeded to visit Hebron, and returned to Amman. The visit may be interpreted on a number of levels. First, it occupies a place in the history of the organization—the Islamic Congress—in whose service Anwar Sadat came to Jerusalem. More broadly, the Islamic Congress may be located in the context of the Egyptian struggle against the Baghdad Pact. How did Sadat operate in Amman? The first secretary of the British embassy there suspected that Sadat personally bribed the Palestinian ministers in the government to threaten resignation over the Baghdad Pact, describing Sadat as “one of the direct causes of the breakdown of the negotiations with the Jordan government.”12 On December 14, just after Sadat’s departure, serious riots broke out on both banks of the Jordan, putting the regime in peril. The American ambassador to Jordan had no doubt about the causes of the unrest: “During the internal crisis and riots of December 14-21, 1955, the strength of Egyptian influence was manifest. Very revealing also is public acceptance and even approbation of subversive character of Egyptian activity.”13On his return to Egypt, Sadat claimed he had succeeded in uncovering a vast British conspiracy to recruit the Arabs to the Baghdad Pact.14 In his memoirs, he wrote: “It is no exaggeration to say that I played an important part in the frustration of the Baghdad Pact.”15 Indeed he did. The meaning of the words “encouragement” and “support” in the lexicon of Copeland was usually financial rather than moral. Hassan Touhami, one of Nasser’s most trusted aids, was also Copeland’s own link to Nasser. Copeland’s hint receives some validation from a report of the French ambassador to Egypt, dating from 1954, which relates rumors to the effect that “American circles” viewed the establishment of the Islamic Congress favorably, seeing it as something useful for its own future political plans.17 Just how the Americans rationalized this support is an unknown. Sadat at the Aqsa Mosque during the same visit. Sadat’s visit to Jerusalem also occurred on another plane: that of the struggle between the Free Officers regime in Egypt and the Muslim Brotherhood. The Jordanians, in permitting such a conference, faced a dilemma similar to that confronted the British authorities in Jerusalem twenty-two years earlier. The Jordanians feared that the conference would turn into an anti-imperialist, anti-British, anti-French, and anti-Soviet demonstration—and a diplomatic embarrassment. At the same time, they wished to allow the Muslim Brotherhood to show solidarity with Jordan against the Zionist enemy. The authorities therefore set limits to the scope of the conference. Its resolutions were to relate only to the struggle against Israel. The participants held an informal gathering after the conference, in Amman, where they vented their opposition to various forms of imperialist oppression (British, French, and Soviet).21 Following the conference, a secretariat was established in Jerusalem, which was supposed to organize future conferences. Sa‘id Ramadan, a leading Egyptian Muslim Brother, was elected secretary general of the conference, and Kamil al-Sharif, another Egyptian Muslim Brother, was named his deputy. During the course of 1954, the relationship between the Nasser regime and the Muslim Brotherhood deteriorated rapidly, especially after a failed assassination attempt against Nasser on October 26. As the crackdown evolved, Egypt also tried to create difficulties for the Muslim Brotherhood in Jordan, and especially in Jerusalem. Cairo pressured Amman to close the secretariat of the Islamic Congress, and when Sa‘id Ramadan entered Jordan in April 1954, Jordanian intelligence detained and interrogated him. Ramadan threatened to transfer the secretariat to another country.22 He later moved to Syria, where he felt more secure. In September 1954, he and Sharif were stripped of their Egyptian citizenship, and Sharif was expelled from Jordan in November 1954.23 In the summer of 1955, authorities shut down the office of the conference, in the Old City of Jerusalem. Despite this, a number of mediation efforts were undertaken, especially by Syrian ulama, in order to resuscitate the Jerusalem conference. Against this background, it is possible to detect a second hidden mission in Sadat’s visit, and especially in his proposal to establish an Islamic cultural center on the Mount of Olives. The center, under Egyptian supervision, would assure that Jerusalem would not be turned again into stronghold of the Muslim Brotherhood in future—a firm base from which the Brotherhood could operate against the Egyptian regime. The center would also have established Egypt as champion of the struggle to preserve the Islamic character of the city against Zionists enemy. On his 1955 trip, he slightly moderated his tone. In Damascus, prior to his arrival in Jordan, he said he saw no obstacle to unifying efforts with those who had held their conference in Jerusalem, provided that they first distance themselves from politics, since only harm came to Muslims by inserting religion in political affairs.25 In Jordan, in response to a question, Sadat said that his organization wished success to “those who organized their last conference in Jerusalem”—that is, the Muslim Brothers—and that there was a need for “tens” of such conferences.26 In this manner, Sadat avoided direct public criticism of the efforts of the Muslim Brothers, who had enjoyed the cooperation of the religious establishment in Jerusalem. But the timing of Sadat’s visit—shortly after the closure of the conference office in Jerusalem and the expulsion of its organizers—indicated that Sadat did not expect to operate alongside the Muslim Brothers in Jerusalem, but in their place. But Nasser poured cold water on the idea. In a conversation with ‘Abd al-Hadi, Nasser warned of the downsides of holding an Islamic conference in Jerusalem. There was a danger that the Christian world would react negatively to such a conference, viewing it as an attempt to enforce the supremacy of Islam over the holy places. He also doubted that the Arabs would receive any meaningful support from non-Arab Muslims, who so far had extended no material or moral assistance to their Arab brethren.28 It seems likely that Nasser also did not wish to rule out other options for solving the Jerusalem question, which might have involved internationalization of the city. So it was no surprise that Anwar Sadat, during his visit, evaded the question of whether the Islamic conference might be held in Jerusalem itself. Such a decision, he stated, rested with the higher council of the Islamic Congress. As a gesture to his hosts, he said that he personally preferred Jerusalem, but also made it clear that this preference was his alone.29In fact, there was never a serious plan to convene an actual conference in Jerusalem (or anywhere else). Egypt’s aim, through the Islamic Congress, was to prevent future Islamic conferences in Jerusalem—specifically, those organized by the Muslim Brotherhood. Upon the conclusion of his visit to Jerusalem, Sadat continued on his way to Saudi Arabia, the Gulf, and Iraq. He left Jordan in a state of turmoil, having successfully done his part to block its path to the Baghdad Pact. But the Islamic Congress spent itself in the process. Nasser later presented the Islamic Congress itself as a casualty of the Baghdad Pact, in a speech in 1966: “When the Baghdad Pact was formed early in 1955 it became impossible for the Islamic Congress to be convened as a political conference not linked with imperialism… After the creation of the Baghdad Pact and the joining of Turkey, Iran, Pakistan and Iraq, it became difficult for the Islamic Congress to meet on a political basis. We therefore pursued the idea on a popular level.”30 By 1956, Saudi Arabia had also dropped out, leaving the Islamic Congress as a purely Egyptian propaganda tool, devoted to spreading Egyptian influence in Africa, India, and Southeast Asia. Sadat himself moved on in 1961, to be replaced by Kamal al-Din Husayn, a Free Officer known for his Islamic leanings. By that time, the Islamic Congress had disappeared from public view. Likewise, nothing ever came of the plan to establish an Islamic cultural center on the Mount of Olives. Egyptian-Jordanian relations began to deteriorate, and in the course of 1956, Nasser sought to undermine the very foundations of the Hashemite Kingdom. The Jordanians, a few years later, permitted the construction of the Inter-continental Hotel (today, the Seven Arches) precisely where Sadat had envisioned the site of the Islamic cultural center. The Jordanians also allowed the Muslim Brothers to return and reestablish themselves in Jerusalem. Signs of reconciliation were evident already in 1956. The Jordanians did not permit the Muslim Brothers to convene their conference in Jerusalem that year, so it was held in Damascus. But the participants received permission to visit Jerusalem after their conference, and the conference bureau reopened in Jerusalem.31 The Muslim Brothers subsequently held three more conferences in Jerusalem between 1960 and 1962. Among the participants were some of the most notable figures in the pantheon of radical Islam. In addition to those who participated in 1953, mentioned earlier, additional participants included Abu al-A‘la Maududi, leader of the Jama‘at-e Islami of Pakistan; Ayatollah Mohammad Taleqani of Iran; Fathi Yakan from Lebanon; and many others. As the hostility between Nasser and King Hussein grew, so did the criticism of the Egyptian regime unleashed at these conferences. They served not only the purposes of the Muslim Brothers, but also those of King Hussein, against his enemies both at home and abroad. In 1962, the Muslim Brotherhood convened its last conference in Jerusalem. Many members had moved on to Saudi Arabia, and there they took to convening in the holy cities, and especially during the pilgrimage season. Saudi Arabia had become a more secure base from which to conduct their campaign against the Nasser regime. The office of the conference nevertheless continued to operate in Jerusalem. After 1967, it relocated to Amman, where it became an appendage of the Jordanian Ministry of Religious Endowments. In summation, during the Jordanian period, the uneasy alliance between the Hashemite monarchy and the Muslim Brotherhood succeeded but little in advancing the cause of Jerusalem on the Islamic level. The divisions in the Arab and Islamic worlds, over the Baghdad Pact and the role of the Muslim Brotherhood, prevented the creation of an organized framework for strengthening the position of the city, raising funds for its Islamic sites, and convening gatherings in solidarity with the struggle for an Islamic Jerusalem. Such frameworks were established only after 1967, and especially after an act of arson damaged the Al-Aqsa mosque in 1969. It was the fire that finally brought about the creation of an Islamic organization of states, from which there emerged the Jerusalem Committee in Morocco, the Jerusalem Fund, and a wide range of activities on behalf of Jerusalem in the Islamic world. The Organization of the Islamic Conference, according to its constitution (article 21), is committed to moving its seat from Jedda to Jerusalem upon the “liberation” of the city. Whether it will seek to do so in the way that Sadat proposed in 1955, or in the way he paved in 1977, remains to be seen. Anwar Sadat prays in the Aqsa Mosque on his second visit to Jerusalem, November 1977. 1. Anwar el-Sadat, In Search of Identity: An Autobiography (New York: Harper and Row, 1978), insert between pp. 216-17. 2. “I left early in the morning, Sunday, for al-Aqsa Mosque to perform the Bairam prayers. I was in Arab Jerusalem for the second time in twenty-two years. (The first time was when I was Minister of State and secretary-general of the Islamic Congress. )” El-Sadat, In Search, p. 310. 3. Filastin, al-Difa‘, December 12, 1955. 4. Filastin, December 13, 1955. 5. Filastin, December 13, 1955. 6. Al-Difa‘, December 13, 1955; Al-Ahram, December 13, 1955. 7. Filastin, December 13, 1955; Al-Ahram, December 13, 1955. 8. Al-Difa‘, December 14, 1955. 9. Sadat press conference, Al-Ahram, September 17, 1954; “Congrès islamique annuel,” Cahiers de l’Orient contemporain (Paris), no. 30 (2d semestre, 1954), pp. 146-47; “Le Congrès Islamique,” Mélanges de l’Institut Dominicain d’Études Orientales du Caire (Cairo), vol. 3 (1956), pp. 471-78; Mahmud Brelvi, “The Islamic Congress (Al-Mo’tamar al-Islami), Cairo: A Brief Survey of its Work,” The Islamic Review (Woking, England), vol. 44, no. 10 (October 1955), p. 13, http://www.wokingmuslim.org/work/islamic-review/1955/oct55.pdf. 10. Al-Ahram, August 25, 1953. 11. Davar, December 12, 1955. 12. Heath Mason, first secretary, dispatch of December 31, 1955, FO371/121476. 13. Lester D. Mallory, U.S. ambassador to Jordan, dispatch of January 5, 1956, Foreign Relations of the United States, 1955-1957, Volume XIII, Near East: Jordan-Yemen (Washington, D.C.: GPO, 1988), p. 13; http://history.state.gov/historicaldocuments/frus1955-57v13/d11. 14. Al-Jumhuriyya, December 24-27, 1955. 15. El-Sadat, In Search, p. 136. 17. Maurice Couve de Murville, French ambassador to Egypt, dispatch of September 22, 1954, archive of the French Embassy in Cairo, carton 70, 12/, “Congrès Islamique,” now at the Centre des archives diplomatiques in Nantes, France. 18. Al-Ahram, December 10, 1953. 19. Al-Ahram, December 10, 1953. 20. Ha-Po‘el Ha-Tza’ir, December 22, 1953. 21. Filastin, December 12, 1953. 22. French consul in Jerusalem, despatch no. 340 of April 12, 1954, archive of the French Embassy in Cairo, carton 70, 12/5C, “Frères musulmans,” now at the Centre des archives diplomatiques in Nantes, France. 23. French consul in Jerusalem, despatch no. 1045 of November 29, 1954, archive of the French Embassy in Cairo, carton 70, 12/5C, “Frères musulmans,” now at the Centre des archives diplomatiques in Nantes, France. 24. Al-Ahram, September 17, 1954. 25. Al-Ahram, December 12, 1955. 26. Al-Difa‘, December 13, 1955. 27. ‘Awni ‘Abd al-Hadi, despatch of May 19, 1954, quoted by Khayriya Qasimiya, ‘Awni ‘Abd al-Hadi: Awraq Khassa (Beirut: PLO Research Center, 1974), p. 199. 29. Al-Difa‘, December 12, 1955. 30. Address by President Gamal Abdel Nasser at the great popular rally held by the Arab Socialist Union in celebration of the anniversary of Unity Day, Cairo, February 22, 1966 (Cairo: National Publication House, 1966), pp. 37-38; Al-Ahram, February 23, 1966. 31. Filastin, July 2, 1956. This post first appeared as an article for Commentary on March 26. Today, March 26, marks the 35th anniversary of the signing of the Israeli-Egyptian peace treaty, most famously evoked by the three-way handshake on the White House lawn that changed the Middle East. Israeli prime minister Menachem Begin and Egyptian president Anwar Sadat put war behind Israel and Egypt, and in so doing, ended the Israeli-Arab conflict. The Israeli-Palestinian conflict continues, and so too does the Israeli-Iranian struggle. But Israeli-Egyptian peace put an end to the destructive battlefield wars between Israel and Arab states, of the kind that erupted in 1948, 1956, 1967, and 1973. Since the famous handshake among Begin, Sadat, and Jimmy Carter, there has been no destructive battlefield war between Israel and a conventional Arab army. And Egypt and Israel now have been at peace longer than they were at war. Yet in a briefing paper prepared for the U.S. team prior to the Camp David, these sentences appear: “Both Begin and Sadat have evidenced similar personal and national objectives throughout their familiar transformation from underground fighter to political leader. Despite their often vituperative comments, each should be able to recognize the other as a politician basically capable of change, compromise, and commitment.” The idea that the similarities between Begin and Sadat made peace possible has been scanted in that interpretation of the negotiations that features Jimmy Carter as hero. This is no surprise. No two leaders could have seemed more different, and it is almost too easy to enumerate the contrasts. For starters, Anwar Sadat came from a poor village in the Nile Delta, a place of almost immemorial permanence. Begin came from the crumbling world of East European Jewry, later erased from the earth. Sadat was an Axis sympathizer during the Second World War. Begin’s parents and brother were murdered by the Nazis. Sadat made a career of the military, and even died in a military uniform. Begin was a civilian through and through. Americans found Sadat to be alluring and easy-going, a gregarious man in a leisure suit. They regarded Begin as rigid and ideological; one American official remarked that, even at Camp David, Begin was always dressed “as though he were about to go to a funeral.” Sadat was an authoritarian dictator who sent his opponents to prison. Begin was a classic liberal with a firm commitment to democracy and the law. Etcetera. But the similarities between the two are just as striking—perhaps even more so—and it may be precisely the personal parallels that brought them together at the crucial moment, and made the achievement of peace possible. One obvious similarity is the one to which the U.S. briefing paper alluded, in describing both as “underground fighters.” In fact, both entered politics through the back door, as conspirators who planned political violence and who were steeled by long stints in political prison. When we were schoolboys we had gone out twice a day to have a look at Nahhas, cheering and applauding as he rode down to work and back. He had been a mythical hero—a peerless symbol of patriotism, self-sacrifice, and devotion. But then he lost everything and we came to regard him as a traitor. His disloyalty to Egypt and her people made his removal a national duty. We therefore decided to get rid of him. The group staked out Nahhas’s motorcade; one of the members threw a grenade, but luckily for Nahhas, it missed his car. The group was quite disappointed; eager to assassinate someone, they decided to kill the former finance minister, Amin Osman Pasha. This succeeded, and while Sadat was not the triggerman, he was tried as part of the conspiracy and was acquitted only after a lengthy trial. Menachem Begin had the more famous “underground” career. He was first sent off to prison during the Second World War by the Soviet secret police, the NKVD—an eight-month travail he recounted in his memoir White Nights. By then, he too had been initiated into a life of clandestine conspiracy—methods of operation he would bring with him to Palestine in the last days of the British mandate. There, at the age of 31, he would rise to leadership of an underground organization, the Irgun, which would be responsible for the 1946 bombing of the King David Hotel in Jerusalem, which killed 91 persons. (Begin would always claim that a telephone call had been placed to warn that the bombs had been planted.) In 1947, Begin ordered the retaliatory hanging of two kidnapped British sergeants. It was, he said, “the most difficult decision of my life,” and an act of “cruel revenge.” Begin managed to stay underground throughout this campaign, pursued by the British who never caught up with him. Clandestine nationalist “underground” activity, involving violence against the British Empire and its collaborators, represented a clear parallel in the careers of Sadat and Begin. So, too, was their eclipse during their middle years, as the British Empire retreated from the Middle East and Egypt and Israel gained full independence. Both men spent many years on the political margins, overshadowed by charismatic leaders who had a stronger grip on the imaginations of their peoples. Sadat was a member of the Free Officers conspiracy in 1952, and was part of the cabal of young officers who overthrew the monarchy. But after Nasser emerged decisively as the leader, Sadat came to be regarded as the most colorless man in the ruling clique. He was socially conservative, rather more religious than his colleagues, and seemingly a bit less sophisticated because of his rural origins. He spent eighteen years in the looming shadow of Nasser, and became his number two only in the year before Nasser’s death. No one could have guessed, during Nasser’s long-running high-wire act, that Sadat would succeed him. (Sadat’s deferential posture may have spared him being purged by Nasser, who never considered him a threat.) When Sadat became president, he was 52 years old—the same age as Nasser on his death. Begin languished even longer on the margins. The Zionist revolution was credited to David Ben-Gurion, the man associated most directly with Israel’s war of independence and institution-building. The Revisionists led by Begin would always claim to have played a crucial role in Israel’s struggle for independence, by their acts of resistance—some would call them terror—against the British and the Arabs. But this was a disputed narrative—one put forward by Begin in his book The Revolt—and one that left the great majority of Israelis unmoved. The evidence for this was the performance of Begin’s political party in Israeli elections. Begin was a perpetual denizen of the opposition benches in the Israeli parliament. In a political landscape dominated by the Labor Party, he spent decade after decade delivering speeches and doing little else. His opening only came after the 1973 war, launched by Sadat, which finally precipitated a crisis of confidence in the Labor Party leadership, and opened the door for Begin. (Here was a paradox: it was an decision of Sadat that cleared the way for Begin.) When Begin became prime minister in 1977, after leading his own party to defeat in eight election cycles, the world was astonished. He was 64 years old when he assumed the premiership. Sadat and Begin thus spent decades in the shadow of men who effectively issued the declarations of independence of their countries. (Ben-Gurion actually declared Israel’s independence in 1948, and Nasser effectively declared Egypt’s independence by nationalizing the Suez Canal in 1956.) But neither of these giants had managed to bring peace to their peoples. Nasser drove Egypt to defeat in 1967, while Ben-Gurion, despite leading Israel to victories in 1948 and 1956, had been unable to translate military prowess into peace, and this was true of his Labor Party successors as well. They left unfinished legacies, which provided the openings for Sadat and Begin. Begin and Sadat also shared a strongly pro-Western, anti-Soviet orientation. Begin had been thrown in prison by the Soviets, and although it was the struggle against the Nazis that formed him, his animosity toward the Soviet Union, while less in degree, was similar in kind. A champion of Jewish peoplehood first and foremost, he saw the Soviet Union as an oppressive regime of antisemitic evil—in contrast to many on the Israeli left at the time, who remembered the Soviet Union as the great ally of the Second World War, and who persisted in admiring its (supposedly) socialist values. This aversion to the Soviets also held true of Sadat. During Nasser’s years, Egypt aligned itself squarely with the Soviet Union, which became Egypt’s major arms supplier, financier of the Aswan dam, and principal source of diplomatic backing. But Sadat never trusted the Soviets. He was certain they represented another form of colonialism, and that their policies were meant to keep Egypt subservient. He came to power as president in 1970, and already by 1972 he had expelled thousands of Soviet advisers, whom he regarded as agents of a foreign empire, no different than the British of an earlier era. It would be his desire to align Egypt with the West—and particularly the United States—which would set the stage for his decision to visit Jerusalem. Both men also relied heavily on the technique of the strategic surprise. Sadat had attempted, through his first few years in power, to achieve the return of the Sinai Peninsula to Egypt through back-channel diplomacy. He ultimately concluded that what had been taken by force could only be restored by force. That led him to the bold decision to launch war against Israel in October 1973, in cooperation with Syria. His war goals were limited: to compel Israel to come to the table and force the United States to take Egypt seriously as its potential Arab partner. The war produced just enough military success to be portrayed to the Egyptian people as a victory, so that Sadat could claim to have achieved the battlefield triumph that had eluded Nasser. But to translate his (limited) military achievement into something more, there had to be a political move of comparable audacity. This would come in the form of his surprise decision to violate all the norms of Arab political conduct, and pay a visit to Israel where he appeared in the Knesset, Israel’s parliament, and made a famous speech of reconciliation. Begin also was given to the audacious act. Three of them marked his premiership. First, there was the decision to withdraw from all of Sinai, involving the demolition of Yamit, a large Jewish settlement there. It was the first time Israel had ever dismantled a settlement, and it came as a shock, especially to his admirers. Second, there was his decision in 1981 to bomb Iraq’s nuclear reactor—a complete surprise to the world, driven by an inner conviction that he was acting to save Israel. This was followed by his decision to invade Lebanon—a move intended by Begin to complement the peace with Egypt, in remaking Israel’s strategic environment. (If it did so, it was for the worse.) Begin, like Sadat, could also surprise both friends and adversaries with bold moves. Both men were also driven by an almost isolationist nationalism. Nasser had placed Egypt squarely in the Arab circle: Egypt was to lead the Arab world, and the Egyptians were first and foremost Arabs. In 1958, he even briefly subsumed Egypt in something called the United Arab Republic, which joined Egypt and Syria in a single polity. Sadat, in contrast, extricated Egypt from its Arab commitments. He regarded it as a civilization unto itself, so weighty that it could stand aloof and alone. Yes, it would engage in alliances and relationships with other Arab states, but Sadat was determined to put Egypt first, even if that meant that other Arabs might shun it. The two men also had a shared concept of the territorial limits of peoplehood. For Sadat, Egyptian territory was sacred, and the Sinai Peninsula was part of Egyptian territory. The commitment to the Palestinians, in contrast, was vague—diminished, in no small measure, by Egypt’s overall withdrawal from the Arab world. For Begin, the West Bank was sacred—not occupied territory, but Judea and Samaria, Israel’s patrimony. Yet the Sinai was foreign land. Had Begin been driven only by security considerations, he might have resisted withdrawal from the valuable strategic buffer represented by the Sinai. (Some of his advisers thought he should.) But his precise sense of where the Jewish homeland began and ended made possible an agreement based on a total Israeli withdrawal from Sinai. But the parallels in the lives of Sadat and Begin may have worked, in ways subtle but strong, in favor of an agreement. Here were two men forged by prison and violence into believers in their own destiny, but who had been written off politically for decades. By the time they came to power, they were in a hurry to achieve something that would transcend the legacies of their celebrated predecessors. Here were two men who believed that their peoples were fated to struggle alone, but who were prepared to go to extraordinary lengths to cement relations with the United States, in the interests of their peoples but also in order to shut the Soviet Union out of the Middle East. Here were two men who did not shy from the bold gamble, and who actually saw a greater risk in inaction. And above all, here were two men possessed not only by a strong sense of peoplehood, but of its geography, which they conceived in ways that left no overlapping territorial claims. There is one more parallel. Both men finished their lives tragically. Sadat was assassinated in 1981 on the reviewing stand during the annual celebration of Egypt’s October 6, 1973 military offensive. While world leaders attended his funeral, the Egyptian crowds stayed home and so too did Arab leaders. He died in splendid (personal) isolation, mirroring that which he brought upon Egypt. Begin also died in isolation—one he had imposed on himself after he resigned the premiership in 1983, in the wake of the Lebanon war. In the decade between his resignation and his death, in 1992, he went into seclusion. He was buried, as he wished to be, not among Israel’s leaders on Mount Herzl, but on the Mount of Olives, and not in a state funeral, but in a simple Jewish ceremony. For many Egyptians, Sadat’s achievement in war was tainted by an ill-conceived peace. For many Israelis, Begin’s achievement in peace was tainted by an ill-conceived war. The two men who, with Jimmy Carter, shared the world’s stage on March 26, 1979, to thundering accolades, departed this earth to mixed reviews. But the peace treaty signed 35 years ago today has turned out to be the most durable feature of the Middle Eastern landscape, and the bedrock on which the stability of the region rests. Two “incompatible” men forged it—perhaps because, ultimately, they were so much alike. Addresses by Begin and Sadat at the White House State Dinner on March 26, 1979. A Muslim Brother, Muhammad Morsi, has entered Egypt’s presidential palace and taken his seat in the chair once occupied by Nasser, Sadat, and Mubarak. This is a stunning development—a slow-motion Islamic revolution that few envisioned back in January 2011, when the crowds filled Tahrir Square. In fact, it was a strategic master-stroke. From the beginning of the revolution, the Muslim Brotherhood has understood that the fluid situation created by the fall of Mubarak won’t last forever, and that now is the time to seize every possible position they can, before alternatives take form. They want power, they crave power, and they won’t let it slip through their fingers by sitting out even a single contest. At the end of the day, all of the arguments for holding back have fallen by the wayside. They’re going for broke. And have no doubt about the Muslim Brotherhood. The Brotherhood seeks to restore Egypt to the glory it once knew, by implementing Islamic social and legal norms. The translation of Islamic ideology into practice is the point of holding political power. The Brotherhood might not be able to effect an exact translation—that would be difficult—but a translation of ideology into practice it will be. This worries secular Egyptians, the international community, and Israel. At this early stage, many will say that such worries are overblown, that the Brotherhood will adapt and compromise. To consolidate power, it might. But at a later stage, many may regret having been so nonchalant. No one can stop Brotherhood. You say: what about the military chiefs? The military, at times, has appeared to be winning. The revolution got rid of Gamal Mubarak, Husni Mubarak’s son and presumed successor, and that suited the military fine. The parliamentary elections, won by Islamists, demolished the liberals by revealing their weakness. That suited the military fine. This left standing the Muslim Brotherhood and the Salafis. Everyone assumed that they wouldn’t dare put forth a candidate for the presidency. The new president was to have been a consensus personality above party politics—an ElBaradei or Amr Musa. It was the Brotherhood’s decision to run a presidential candidate that threw the military off-balance, and they have been scrambling ever since. The first Brotherhood candidate, the formidable deputy-guide Khayrat ash-Shater, was disqualified—he would have won a sweeping victory. His replacement, Muhammad Morsi, basically a stand-in, had less appeal, and against him, the unlikely Ahmad Shafik stood a chance. But it gradually became evident that even the stand-in might defeat Shafik, hence the drastic measures by the military chiefs, stripping the presidency of most of its powers even before the first ballot was counted. The military’s efforts to contain the Muslim Brotherhood, at this late date, can only buy limited time. The parliament has been dissolved, but it will have to be reconstituted, and then what? The rewriting of the constitution can be delayed, but the constitution will have to be written and approved by the legislature, and then what? And if the president isn’t to be the supreme commander of the Egyptian armed forces, then who will be? The simple truth is that Egypt isn’t going to revert to military rule—it’s too late, the polls show that a vast majority of Egyptians want a transition to civilian, constitutional rule. For the military, the question is, what are the terms of this transition? What will guarantee their economic enterprises? What will assure them that they won’t be prosecuted and purged? This is now the core of Egyptian domestic politics: the terms on which the military will exit. And with each passing day, the hand of the Muslim Brotherhood is strengthened in this negotiation, because it grows more legitimate and the generals grow less legitimate. There are those who think that the Muslim Brotherhood can still be outmaneuvered by gerrymandering the system. In the long term, it can’t. Egypt is headed toward populist Islamist rule, and it is just a matter of time before the Brotherhood checkmates its opponents. So how will the Muslim Brotherhood rule? It is the misfortune of the Muslim Brotherhood that, having waited more than 80 years for power, they have come to it at perhaps the lowest point in the modern history of Egypt. The country teeters on the edge of bankruptcy, the result of decades of bad decisions, corruption, and the absence of the rule of law. The Muslim Brotherhood is in a bind, because it has to deliver. For the masses of people who voted for the Muslim Brotherhood, the revolution wasn’t about democracy and freedom. It was about bread and social justice. The Brotherhood has a so-called “Renaissance” plan for the overhaul of the Egyptian economy. I won’t pretend to judge its feasibility. Could modernization of tax collection double or triple tax revenues? Can Egypt double the number of arriving tourists, even while contemplating limits on alcohol and bikinis? Can a renovation of the Suez Canal raise transit revenues from $6 billion a year to $100 billion? Can Egypt’s economy surpass the economies of Turkey and Malaysia within seven years? These are all claims made at various times by the economic thinkers of the Muslim Brotherhood, who trumpet Egypt’s supposed potential for self-sufficiency. If you think this is pie in the sky, then it isn’t difficult to imagine the “Plan B” of the Muslim Brotherhood. It is to find ways to raise the rent Egypt collects from the West and rich Arabs for its geopolitical position. Call it a shakedown, call it a bailout, it doesn’t matter. The message Egypt is sending is that it’s too big to fail, and that the world, and especially the United States, owes it. The deputy guide, Khayrat ash-Shater, put it directly: “We strongly advise the Americans and the Europeans to support Egypt during this critical period as compensation for the many years they supported a brutal dictatorship.” Egypt, which is one of the largest recipients of U.S. foreign aid, is thus owed compensation. So the question the United States faces will be this: is Egypt indeed too big to fail? Is the United States now not only going to talk the Muslim Brotherhood—which it is already doing—but actively work to help it succeed? The question comes at a time when the United States has become frugal. And there is no superpower rivalry that Egypt can exploit. When John Foster Dulles informed Nasser in 1956 that the United States wouldn’t finance his great dam at Aswan, Nasser went to Moscow. Today there aren’t any alternatives to the United States. That being the case, the only way for Egypt to get the attention of Washington is to threaten to spin out of American orbit and into the opposing sphere of radical Islam. At no point will it be indisputable that the United States has “lost Egypt.” But at every point, Egypt’s loss will seem imminent. In that respect, the Muslim Brotherhood has already made its mark on history: from this day forward, Egypt can’t ever be taken for granted again.